Roger Federer has won it all. Or almost. Five Wimbledon crowns, four US Open titles, three Australian Opens. Who has won more? Pete Sampras, with his 14 Grand Slams but for how much longer? Halted recently in his chase to catch the American, the Swiss master lost in the Aussie semi-finals against Serbia's Novak Djokovic, perhaps a sign that he might not have it all his own way in the Olympic year of Beijing. In fact the Olympic gold is high on his list of priorities and one of the more notable titles alongwith the French Open and Davis Cup as those missing on his long list of honours. All signs point towards Federer surpassing Sampras and since his first Wimbledon crown in 2003 at the age of 21, the 'Federer Express' has been virtually unstoppable. More than 200 weeks in a row at world number one (Jimmy Connors amassed 160) and still counting. Fifty-four straight wins on grass, five straight Wimbledon titles to equal Bjorn Borg's mark and ten straight Grand Slam finals between Wimbledon 2005 and the 2007 US Open. If 2003 was the consecration of his immense talent with his first title in London, 2004 was an even greater explosion of success. He won three of the four Grand Slams, the first man to achieve this feat since Mats Willander in 1988 and repeated the trick in 2006 and 2007. On February 11, 2004 he became world number one and he is still world number one. Set to turn 27 on the day of the opening ceremony for Beijing, Federer plays the "tennis of dreams" crushing all opponents before him with compliments such as the "magician" or "extra-terrestial" just two outstanding remarks bestowed upon him. Swift, balanced, a good serve, strong at the net and as powerful on his one-handed backhand as his forehand, Federer has no weak points. Only the Spaniard Rafael Nadal has been able to beat him on a regular basis and that has only been on clay. Apart from his nemesis, the Argentine David Nalbandian and Djokovic, he has no serious rivals. The man from Basel gave few impressions in his early career that he would become one of the giants of the game. His South African mother Lynette was a former field hockey champion and he inherited from her a taste for sport. His father Robert was a chemical engineer and pushed him away from studies and more towards wrestling, cards or video games. At 14, he opted for tennis but he was also a handy footballer and lived next door to the home ground of FC Basel. 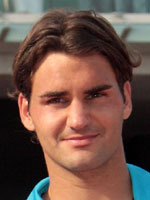 Wimbledon champion in singles and doubles as a junior and a junior world number one, he turned professional in 1998. Timid, he did not initially possess the mental strength to succeed but he did progress steadily and worked hard on his mind, himself and with it came success. Happy with himself, happy with his game, Roger Federer began his gravy train of success in 2003 and not much has stopped him since. If he wins in Beijing, he will not however become the first Olympic champion from Switzerland. That honour belongs to Marc Rosset who swept to the gold medal in Barcelona in 1992.